"We do what's right for our clients and put the client first. Always." Angie sees Bolton & Menk's corporate values woven into the way we work. "We do what's right for our clients and put the client first," she says. "Always." 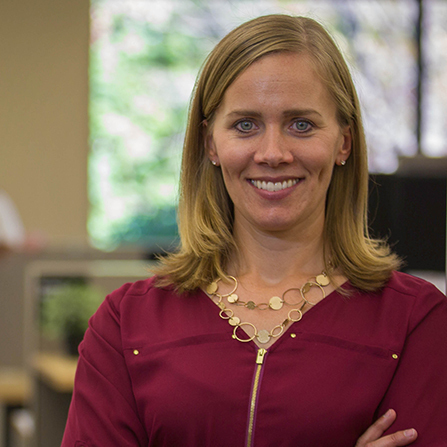 Angie co-leads the firm's planning and urban design work group. She facilitates projects involving transportation, community and environmental planning, landscape architecture, project communication services, and natural/cultural resources. Angie also oversees transportation corridor studies, preliminary design projects, and transportation system plans. Her collaborative leadership style expedites commonly accepted solutions for her clients and key agencies, affected business owners, and community members. After hours, Angie leads a household of five through a busy schedule of school activities and sports. On the weekends, they make time for the outdoors and hit the ski slopes, weather permitting.